Early last year, the intrepid Paddy Barry and Frank Nugent, mountaineer, asked for my assistance in selecting a suitable vessel for a proposed high latitude expedition. After some research we selected Nadja a design by Gilbert Caroff, who has considerable experience in design for polar expeditions. Shallow draft with centreplate raised and a protected rudder. Accommodation for eight crew plus their stores for an extended voyage with fuel storage of 2000 litres to give a range of 2500 miles under power. 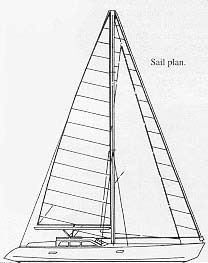 Cutter rigged with roller furling on both headsails, an easily handled sailplan. Large wheelhouse accommodates helmsman, navigation, galley and dining area. Specifically designed and strengthened for encounters with ice. The design seemed to satisfy the team's requirements, so plans were purchased. Frames were lofted in a builders site office at night somewhere in South Dublin, with plywood templates fabricated for each frame. Aluminium, despite its high cost was selected as the building material for low maintenance, durability and ease of construction. As it turned out, I became much more involved in the construction, as ill health forced me to take early retirement. Since May, I have been working a couple of hours a day on the project, with Paddy, Frank and other team members working at the weekends, doing the heavy work. All the hull plates were lifted into position by the enthousiastic members of the local football team on the promise of a sailing weekend next summer! As the plans are in French we use the boatbuilding terms as noted- Barrots,Varangues,Lisses etc. are added to the Mayo boatbuilding vocabulary. The hull was built upside down and rolled over without incident in September. Launch date is planned for early 2001. Following sea trials and a shakedown cruise we plan to sail towards the west coast of Greenland to attempt the Northwest Passage. As I look at her bow I think of Joshua Slocum's remark on his Spray as he fitted double breasthooks "that she might shunt ice" Northabout, as the new vessel is named, with its raised icebreaker bow, likewise should shunt ice. The 49 foot Northabout, an aluminium built sailing boat under construction May 2000 with four of the crew.